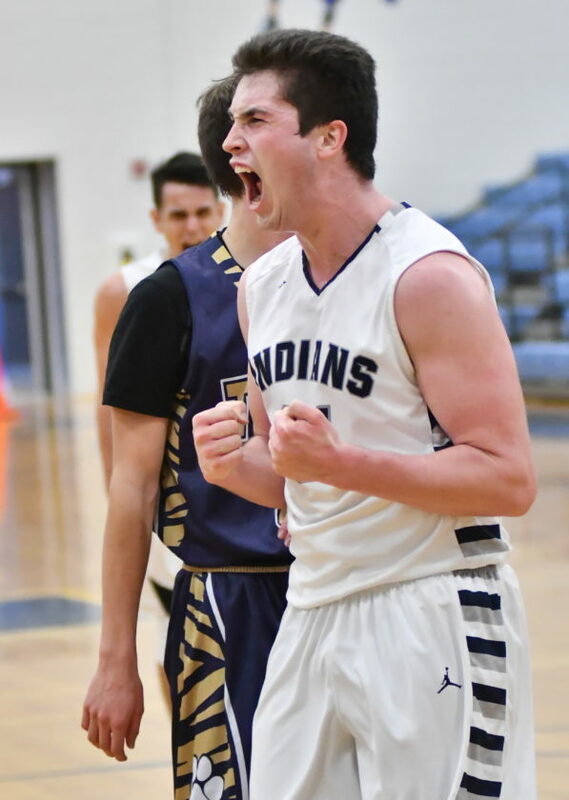 MARK NANCE/Sun-Gazette Muncy’s Matt Coyner celebrates after scoring two points with a foul as the Indians extended their lead over North Penn-Mansfield in the fourth quarter at Montoursville High School on Saturday. One by one, Muncy coach Jason Gresh pulled his starters as the game neared its conclusion Saturday. One by one, he gave them big hugs. More work remains, but one better believe this was a big moment. Muncy has come a long way the last two seasons and continued its upward climb Saturday at Montoursville, playing a brilliant second half and defeating defending champion North Penn-Mansfield, 69-50, in the District 4 Class AA semfinals. Muncy (16-7) reached its first district final since 2004 and also clinched a second straight state tournament berth after scoring 52 second-half points and turning a two-point halftime deficit into a convincing win. Many good things happened throughout a dominant second half as Muncy earned a spot in the championship against Northeast Bradford. North Penn-Penn Mansfield (16-10) can still reach states if it wins the third-place game against Wyalusing. Mansfield led 19-17 at halftime after Jayden Andrews (five assists, five steals) made a last-second steal and buzzer-beating layup. Muncy was unfazed and put together one of its best second-half performances this season. Rymsza scored 20 of his 26 points, Nate Paisley added 13 of his 18 and Coyner controlled the inside as Muncy outscored Mansfield, 52-31. The Indians made a remarkable 80 percent of their second-half shots and displayed an outstanding inside-outside game. A Kolby Moyer 3-pointer early in the third put Muncy ahead to stay, all five starters scored in the third and the Indians closed the quarter on an 11-2 run as Paisley’s buzzer-beating 3-pointer gave it a 10-point lead. 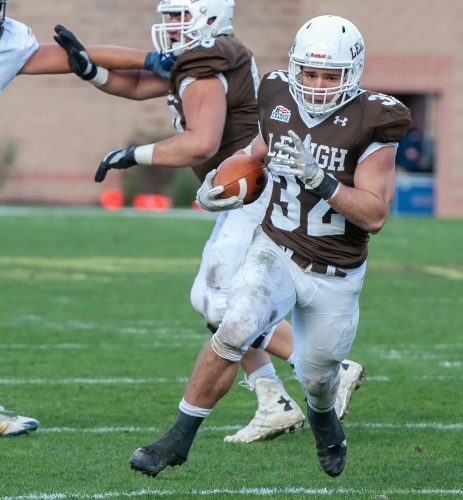 Muncy effectively moved the ball, set each other up for good shots and received a lift from reserves like Jordan Yaple and Kyle Lenhart who helped spark the defense. Dylan Wilt was a big factor as well, grabbing seven rebounds and joining with Coyner to slow an explosive Mansfield inside game. Rymsza’s second-half performance bordered on the unbelievable, too. The junior guard was so hot, one was waiting for flames to start shooting from his hands. Rymsza scored 12 third-quarter points, eight more in the fourth and made all six shots from the field. He also went 6 of 7 at the foul line in the fourth quarter and his consecutive 3-pointers late in the fourth started helping Muncy break things open. Mansfield suffered a big blow late in the first quarter when standout forward Dylan Meyer limped off with an ankle injury. The Tigers also encountered first-half foul trouble and endured an awful shooting performance. Despite all that, Mansfield still led at halftime. It heated up for a little bit in the third quarter as Brent Burleigh scored six straight points and cut the Muncy lead to 33-32 with a drive. After that, Muncy took over. Burleigh and Nick Kasper each scored 11 points but Mansfield made only 31 percent of its shots. Still, the Tigers can reach states for a second straight year if they shake off that performance and beat Mansfield in the consolation game. Mansfield pulled as close as nine points midway through the fourth quarter, but Moyer answered with a driving basket and Paisley found Coyner inside for a 3-point play a possession later as Muncy started putting the finishing touches on a performance 14 years in the making. Muncy avenged a semifinal loss against Mansfield from last year. That team included all-state guard Jeff Fry and many that when Fry graduated, Muncy’s 2018 title hopes went with him. Instead, the Indians have rallied and have given themselves quite an opportunity. Dylan Meyer 1 0-0 2, Garrett David 3 1-3 7, Nick Kasper 3 3-6 11, Brent Burleigh 5 1-1 11, Jayden Andrews 2 0-0 5, Jacob Green 2 0-0 5, Sawyer Freeman 2 0-0 4, Logan Tokarz 1 0-0 3, Kamren Manikowski 0 2-2 2. Totals 19 7-12 50. Nate Paisley 4 6-9 18, Matt Coyner 4 7-7 15, Noah Rymsza 9 6-7 26, Kolby Moyer 2 0-0 5, Dylan Wilt 2 1-2 5, Jordan Yaple 0 0-0 0, Levi Messenger 0 0-0 0, Kyle Lenhart 0 0-0 0. Totals 21 21-25 69. 3-point goals: NPM 5 (Kasper 2, Andrews 1, Green 1, Tokarz 1); Muncy 4 (Rymsza 2, Paisley 1, Moyer 1). Records: Muncy (16-7), North Penn-Mansfield (16-10).